The Gimlet is a classic cocktail that can be made with either gin or vodka and Lime Cordial. For this version of the Gimlet we’ve added aromatic basil leaves and went for fresh lime juice and the crisp, smooth taste of Hendrick’s Gin. 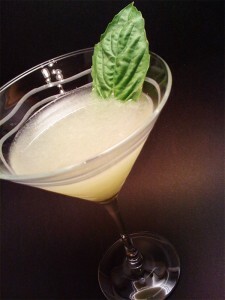 Drop 4 of the large basil leaves into a cocktail shaker and gently press into them with a muddler or back of a wooden spoon. Add the simple syrup, gin, lime juice and fill with several ice cubes. Shake then strain into a cocktail glass. Garnish with a fresh basil leaf.